As a research associate with ILSR’s Energy Democracy and Community-Scaled Economy initiatives, Marie contributes content and provides support to communities investing in distributed energy systems and locally owned businesses. She analyzes and writes about the implications of corporate concentration and monopoly in our energy and economic systems. In addition, she helps coordinate the Advocates for Independent Business coalition. An interdisciplinary researcher with a background in environmental policy, Marie brings a passion for urban sustainability, social justice, and public policy to her work. 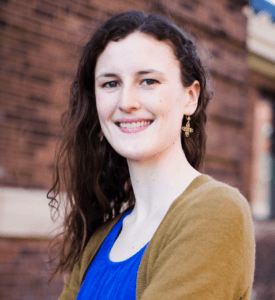 Before joining ILSR, Marie served as a program manager and researcher at the University of Minnesota’s Institute on the Environment, exploring connections between nature and human well-being. In previous roles, she has worked closely with Detroiters Working for Environmental Justice, U.S. EPA Office of Transportation and Air Quality, Climate Generation, Metropolitan Planning Council, and the Center for Neighborhood Technology, among others. In 2014, Marie earned her M.S. in natural resources and environment at the University of Michigan’s School for Environment and Sustainability in Ann Arbor, Mich., focusing on environmental policy and planning. She also holds a B.A. in economics and environmental studies from the University of Chicago. While now based in Minnesota’s Twin Cities, Marie has called numerous other places home including Michigan, Illinois, Iowa, and New York. Outside of work, she enjoys exploring cities and parks on foot or bike, baking, and visiting independent bookstores, especially the one her parents own in western Michigan. Reach Marie on Twitter at @mlynndonahue, or by email at mdonahue [at] ilsr [dot] org.